A Promissory Note, or loan agreement, is used to record that one party promises to pay a sum of money to another party at a later date. This obligation usually results from a loan to the promising party. Creating a Promissory Note or loan agreement is often recommended for tax and record-keeping reasons. This form is also known as: loan agreement, secured loan agreement, demand note. How many Borrowers are there? Is this Borrower a corporation? How much is being borrowed (e.g. 20,000.00)? Will this loan be subject to interest? Will payment be due when the Lender demands? Payment must be received within how many days of demand? Will payment be in a lump sum? How often will installments be paid? Which day of the week will payment be due? Which day of the month will payment be due (e.g. first)? How many installments will there be? When will payment of installments begin? How much will each installment be (e.g. 50.00)? How much will each installment be (e.g. 60.00)? Are the Borrower(s) allowed to pay off the loan early? You may wish to add a security to the loan. The lender can take the security if the borrower fails to repay the loan. Will this loan have a security/collateral? You can usually find the VIN on the base of the windshield, or on the vehicle's title. The HIN is usually on the right side of the water craft's transom (back). Is the Lender selling the security to the Borrower(s)? Will Borrower(s) be charged interest if payment is late? We highly recommend that your Promissory Note be signed in front of a Notary Public and one or more witnesses. Will a notary public be present? How many witnesses will be present? Do you know when you will be signing the agreement? We strongly recommend obtaining an attorney reviewed Promissory Note directly from us. For value received, the Borrower hereby unconditionally promises to pay to the Lender the sum of ___________ together with interest accrued at the rate of ________ percent per year on any unpaid balance. The entire outstanding amount shall become immediately payable upon demand by the Lender providing that such demand not be made before the ______ day of _____________________ 20____. Payment shall be made at the above stated address of the Lender or at such place as may be designated from time to time in writing by the Lender. The Borrower may prepay this Note in full or in part at any time without premium or penalty. All prepayments shall first be applied to accrued interest and thereafter to the principal loan amount. Should the Borrower not make full payment within 14 days of demand, this Note may be turned over for collection and the Borrower agrees to pay all reasonable legal fees (on a solicitor basis) and out-of-pocket expenses to the extent permissible by law, in addition to the other amounts due. 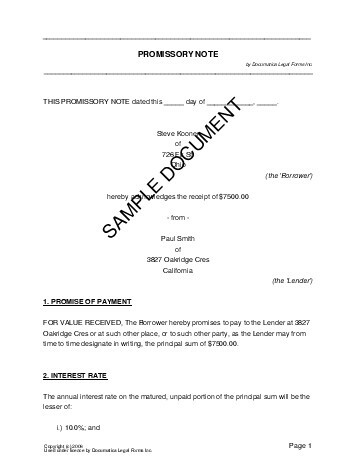 The Lender may transfer this Note to another holder without notice to the Borrower and the Borrower agrees to remain bound to any subsequent holder of this Note under the terms of this Note. All Borrowers or Co-signors identified in this Note shall be equally liable for the repayment of the debt described in this Note. The Borrower waives presentment for payment, notice of non-payment, off-set, protest and notice of protest and agrees to remain fully bound until this Note is paid in full. The terms of this Note shall be binding upon the Borrower's successors and shall accrue to the benefit and be enforceable by the Lender and his/her successors, legal representatives and assigns. This Note shall be construed, interpreted and governed in accordance with the laws of _______________ and should any provision of this Note be judged by an appropriate court of law as invalid, it shall not affect any of the remaining provisions whatsoever. Signed at ______________on this ___ day of April, 2019. For value received, the Borrower hereby unconditionally promises to pay to the Lender the sum of ____________ together with interest accrued at the rate of ________ percent per year on any unpaid balance. The Borrower will pay ________ payments of $_____ each at monthly intervals on the _____ day of each month, starting on the _______ day of _________________20____ until the Principal amount and accrued interest is paid in full. and finally to the Principal. The Borrower may prepay this Note in full or in part at any time without premium or penalty. Payment shall be made to the above address of the Lender or at such place as may be designated from time to time in writing by the Lender. If payment is not made within 7 days as stipulated in the payment terms, the Borrower shall be required to pay an additional late fee in the amount of $______. If the Borrower fails to make any payment when due and the Lender provides notice of such failure, the Borrower must effect payment of the amount due within ____ days, failing which the Lender can demand immediate payment of the entire outstanding Principal amount, accrued interest and late fees. In the event of default this Note may be turned over for collection and the Borrower agrees to pay all reasonable legal fees (on a solicitor basis), collection other charges to the extent permissible by law, in addition to other amounts due. The Lender may transfer or assign this Note to another holder without notice to the Borrower and the Borrower agrees to remain bound to any subsequent holder of this Note under same terms. All Borrowers identified in this Note shall be jointly and severally liable for the repayment of the debt. The Borrower waives demand and presentment for payment, notice of non-payment, off-set, protest and notice of protest and agrees to remain fully bound until this Note is paid in full. Below are some random samples we have created with Documatica. Please note that these documents reflect a certain set of answers, and it is very likely that the document you require is different. Do not rely on the templates below - create your own customized Promissory Note with our webpage. For maximum legal protection, obtain a lawyer reviewed Promissory Note directly from us.